I’m not a big mourner for the loss of meat in my diet. I became a vegetarian over a decade ago and actually dove right into the process, loving the creativity of finding new ways of cooking healthy foods. And I really love what I eat. I don’t tend to focus too much on trying to make foods taste like meat, and we don’t eat that many meat substitutes. But every now and again, I’m hit with a craving for an old favorite and I try to find a way to make it vegetarian friendly. It was a little bit of envy over a delicious looking crab cake that had me concoct this recipe. When Kevin and I get back from our trips to different parts of Maryland’s eastern shore, or Delaware’s coast, where we are constantly in the presence of fresh, summer sea food, I satisfy my lust with this family favorite. The recipe was concocted over time, by merging different crab-cake recipes and sauces until we hit a combination we liked. Feel free to play around with it to come up with your own. The breadcrumbs, in particular can be reduced if you’d like a little more ‘choke and a little less bread- just don’t cut out too much or your cakes won’t hold together. Also, Kevin & I like the combination of a sweet & a cocktail dipping sauce, but maybe that’s not for everyone. I include those recipes here too, just in case. Happy summer eating to you! The recipe below makes about 4-6 cakes, depending on how big you make them. ** Organic is really best. Traditional canola is extracted using harsh chemicals. Refresh the artichoke hearts by boiling them in a small pot of salted water for 5 minutes. When they are done drain the hot water & rinse. Add cool water to pot and let sit for fifteen minutes. Combine mayonnaise, mustard, celery, Old Bay, black pepper, red bell pepper, and onion in a medium bowl. Put 1/2 cup breadcrumbs on a plate; set aside. 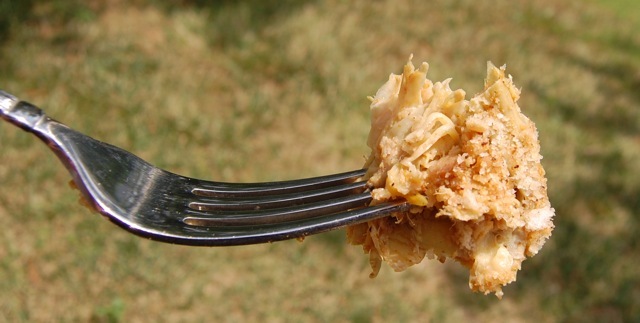 Gently squeeze Artichoke Hearts to get out as much liquid as you can and shred to a crab meat like consistency. If using Hearts of Palm, cut into one-inch chunks, and shred a little, then put into a bowl. With a spatula or wooden spoon, fold into mayonnaise mixture. Add 1 1/2 cup of the breadcrumbs and stir just until blended. Shape into 6 crab cakes, about 3 inches in diameter, pressing well to hold the ingredients together. Press each side gently into the reserved breadcrumbs on the plate. Cover and chill for 1 to 2 hours. Sometimes when I’m running low on time I skip this step, but it does improve the taste. Heat oil over medium heat. 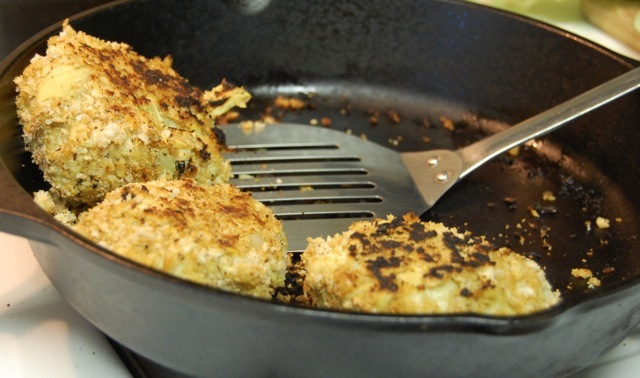 Fry crab cakes for about 5 minutes on each side, carefully turning only once. To prepare sweet dipping sauce, combine ingredients in a small bowl; mix well. Prepare the cocktail sauce the same way in another bowl. Serve Artichoke Cakes with lemon wedges, sweet dipping sauce and cocktail sauce, or any other sauce of your preference. Yes, it’s been so long for me, I’m not sure I remember exactly what they taste like either! Just know I like this version. I just visited your blog (very cute) & now I’m inspired to go get some chocolate chips & try chickpea cookie dough dip. Yum, thanks.